Hike, India’s home grown free cross platform instant mobile messaging app has raised USD 65 million (around Rs. 400 Cr) from foreign investors according to ET report. The round was led by New-York based Tiger Global and have acquired minority stake in the company. 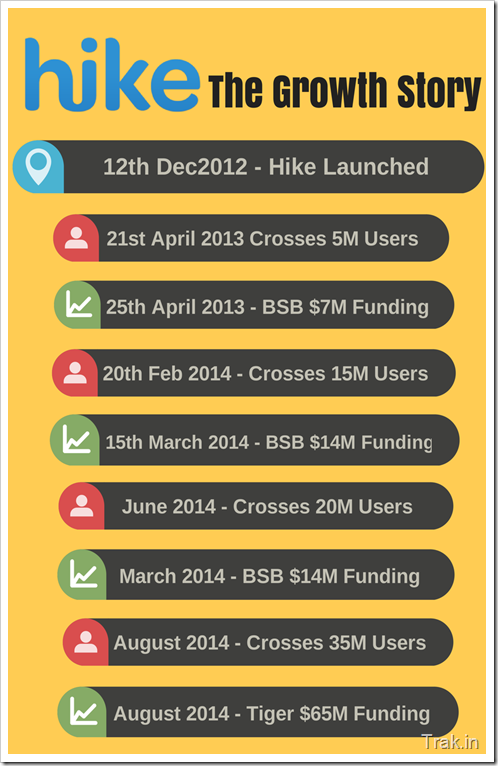 Hike messenger had previously raised 2 rounds of funding, $7 million in April 2013, and $14 million in March 2014, both of which came from Bharti Soft Bank, a joint venture between Bharti Enterprises and Japanese telecom firm Softbank Corp.
On the user growth side, Hike has grown steadily since it’s launch. The user growth seems to have accelerated in past couple of months, with nearly 15 million new users joining in last 2 months alone. Earlier in July, Hike messenger became the #1 free application on Android play store beating likes of its competitor WhatsApp and Facebook messenger. It is now clocking roughly 300,000 downloads per day. Hike has gained traction over last couple of months largely because they have now aggressively started marketing, unleashing series of TV commercials, which are now frequently airing on various TV channels. Hike is currently not monetizing the application in any way, and concentrating purely on gaining users. Interestingly, 90% of the Hike messenger users are based in India, and 80% are under 25 years of age. With these demographic details, Hike has a tough road ahead monetizing the application. From features perspective, Hike does have a few features that are unique to them. Some of them include having password-protected private chats between users and availability of File transfers of upto 100mb. While Hike has been doing well, it’s main competitor and market leader WhatsApp messenger has been steady in its growth. They now have over 65 million users in India and a world-wide active user base of over 600 million people. "Home Grown Mobile Messenger Hike Raises $65M Led By Tiger Global", 5 out of 5 based on 1 ratings.